We thank Melissa — and all our chapter directors — for their courage and dedication to lead the charge against a culture of death and expose the evil of abortion. 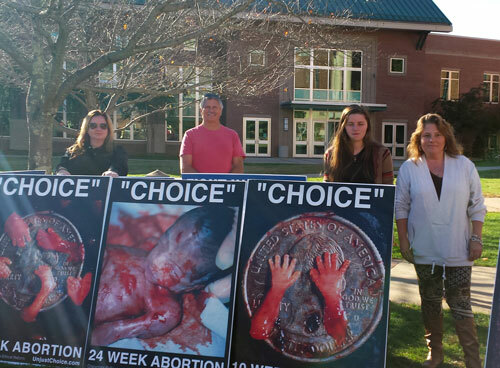 On August 22nd, and again on October 10th, the Anti-Choice Project joined with over 60 state and national organizations in a joint protest against Planned Parenthood coordinated by our friends at Pro-Life Action League and Created Equal. The nationwide protests capitalize on the outrage Americans felt following the release of a series of undercover videos showing Planned Parenthood abortionists and executives negotiating the sale of baby body parts. On August 22nd, more than 50 people held signs for an hour outside the Planned Parenthood in Bremerton. ACP chapters in Bellingham, Dallas, Washington, D.C., and Lincoln, Nebraska also led protests in their cities. Altogether, nearly 100,000 people turned out for 654 individual protests at 374 Planned Parenthood facilities. See photos of displays here. On September 29th, pro-abortionists in Bellingham, Washington, organized a ‘Pink Out Day’ because they were “sick and tired of the relentless attacks on reproductive health care.” Three local businesses — Temple Bar, Redlight and The Shakedown — volunteered to donate 15% of their sales to Planned Parenthood. However, ACP chapter director Bridget Adams made sure their celebration would be short lived, and that patrons of each business would know precisely what their money was going to pay for. As is always the case, horrified at the sight the pro-abortionists tried in vain to hide the truth. 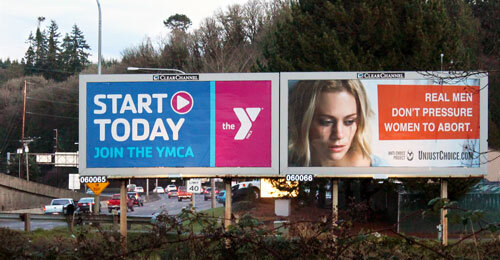 Our only question for them is, if abortion really is a justifiable choice, why should a picture of it be so disturbing? See photos of the display here. 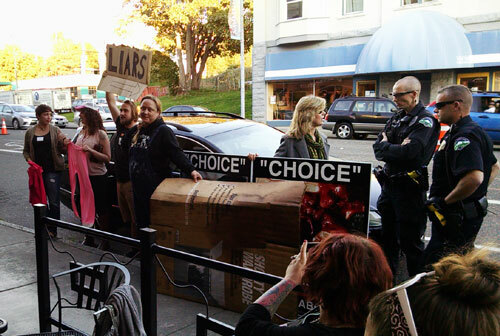 Abortion advocates try to block our “Choice” signs at a Planned Parenthood fundraiser in Bellingham, Washington on September 29th. All of this work is accomplished through your prayers and your financial support. And we want you to know that beginning this quarter the Anti-Choice Project is now able to accept Debit and Credit Card donations without the use PayPal, for those of you who wish to support our work in this way. No account necessary. You can even send us your credit card info back to us in the mail and designate a one-time or recurring gift, and we will take care of the rest. As always, we thank you, and promise to keep you in our prayers.